If you imagine a dreamy wedding ceremony that you will remember for the rest of your life, then Santorini is the right destination. 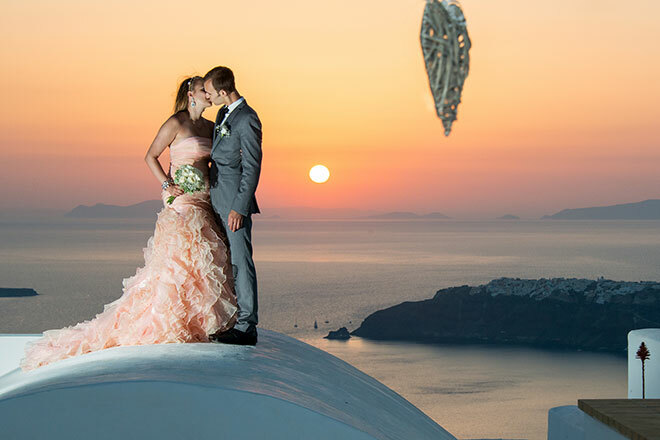 The wild beauty, the fascinating Caldera, the gold sunset and the very good weather conditions are some of the elements that have made Santorini one of the most ideal wedding destinations worldwide. Start by booking your wedding day as soon as possible! You can choose the location depending on the type of ceremony you prefer. Besides, the romantic and famous island of Santorini provides such a great variety of choices to satisfy all kinds of tastes. The ceremony can be held in almost any location of your choice, such as one of the famous hotels, restaurants, wineries, old factories, private museums, sailboats, chapel yards, beaches, and old mansions. The Orthodox ceremony in Santorini can be held at the Orthodox Metropolitan Cathedral, located in the center of Fira (the island’s capital), with a view to the volcano and the sea or in any another Orthodox church located in one of the various picturesque traditional villages around the island. The Catholic ceremony in Santorini is held at the Catholic Cathedral, a baroque church with an elegant bell tower which is part of the Catholic Quarter in the center of Fira. Jewish, Hindu, or any other practicing faiths that can be celebrated in Greece. Whether creating a brand new dream or you’re re-living that special day Santorini is the perfect place to write the next chapter.